The DCB M41 Widebody catamaran, designed by DCB (Dave’s Custom Boats) founder Dave Hemmingson, is the largest model offered in the DCB M-Series. 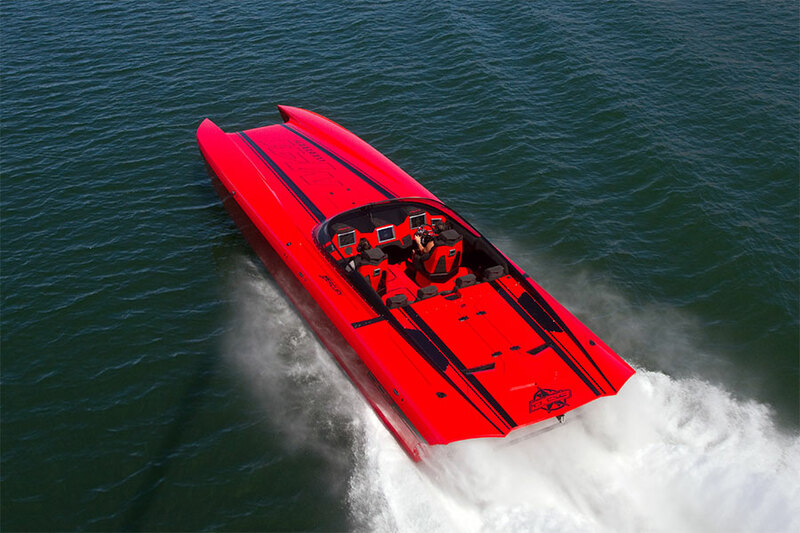 With its precision sculpted design and a pair of Mercury Racing 1350 engines, it speeds across the water at 175mph! Traxxas faithfully captured the incredible looks and performance of the DCB M41 in a detailed scale replica that is versatile, fun, and fast. The catamaran hull delivers the speed, stability and confidence for which the full-size M41 is famous, allowing you to have fun wherever your marine adventures take you. 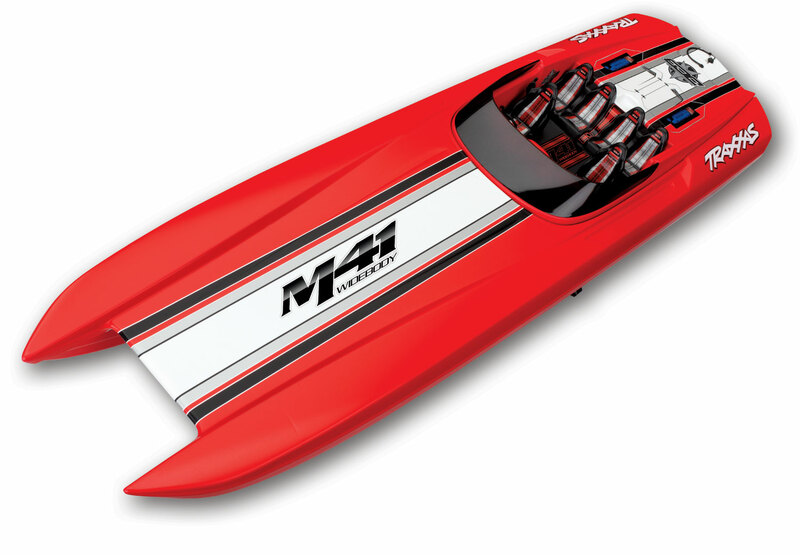 The M41 replica is equally at home blasting across the waves at the lake on a fun run or exploiting its 50+mph speed on a favorite stretch of smooth water. The razor sharp handling lets you carve turns with authority and precision and yet, offers easy control while cruising by the shore. M41 Catamaran lets you select your battery and speed level! Add the battery/charger completer pack (#2990)for the Ultimate Combo. Choose your charging option with M41 Catamaran! Ready-To-Race® The Traxxas DCB M41 Widebody comes fully assembled with a TQi™ 2.4GHz radio system, Velineon brushless power system, applied graphics, and detailed instructions. 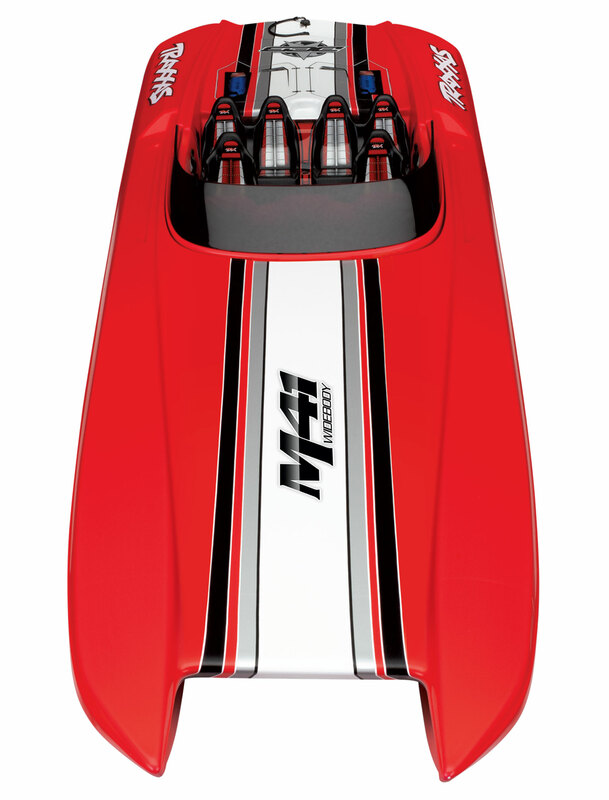 Traxxas backs the M41 and all of our products with industry-leading support that is second to none. A staff of skilled representatives is on-hand to answer your questions via phone, website, or e-mail. Unmatched parts support allows M41 to be serviced with parts and support from thousands of hobby dealers worldwide. Traxxas protects your investment with the Lifetime Electronics Warranty. Traxxas goes the extra mile to ensure that your RC experience is easy, fun, and fast! DCB and M41 Widebody are trademarks of Dave's Custom Boats, LLC used under license. Mercury Racing is a trademark of Mercury Marine. Images and specifications subject to change.